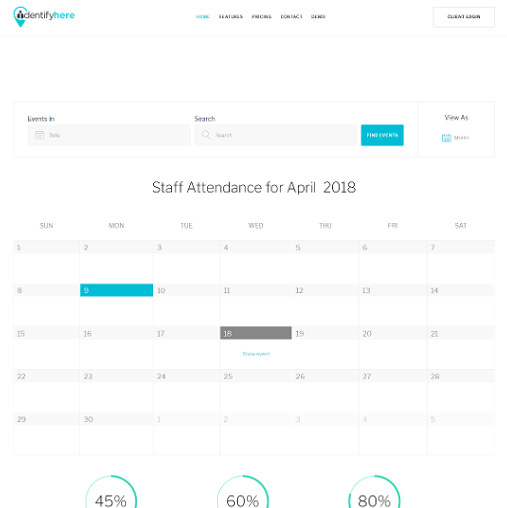 IdentifyHere™ - Cloud Based Staff Attendance System. FREE Clocking In Machine. Enjoy a 90 Day Free Trial For a Limit Time Only. IdentifyHere™ is more than just a Clocking in Machine. We provide a solution that will help you track and manage attendance, simply and easily, from wherever you are. Our software puts you back in control of staff attendance, saving you thousands of hours in administration and improving productivity. Designed to work with the IdentifyHere™ time attendance system. Easy to use and setup WiFi controlled clocking machine. We've made a huge effort to provide you with the most modern and flexible solutions for staff attendance. View real-time reports on time keeping, annual leave, sick days, staff breaks and much more. Access your data anywhere, any time with our easy to use portal. The data is tracked in real time, so you can analyse attendance in real time. Make your payroll simple and accurate, export your data to Payroll, CSV or PDF. Our analytics provide in-depth reporting including real time attendance. A HR System allowing you to create and manage staff profiles, log absence and holidays, view and report time keeping. Pure and simple! We saved thousands of administration hours. It's really easy to use and setup, and the reporting is fantastic! Fantastic service!! Got it up and running in minutes, very simple and easy to use. It almost makes payroll enjoyable! We were considering a traditional clocking system but so glad we found IdentifyHere™, its the 21st century answer to staff attendance.